In the summer of 1943, as World War II raged overseas, the United States also faced internal strife. Earlier that year, Detroit had erupted in a series of race riots that killed dozens and destroyed entire neighborhoods. Across the country, mayors and city councils sought to defuse racial tensions and promote nonviolent solutions to social and economic injustices. In Cincinnati, the result of those efforts was the Mayor's Friendly Relations Committee, later renamed the Cincinnati Human Relations Commission (CHRC). 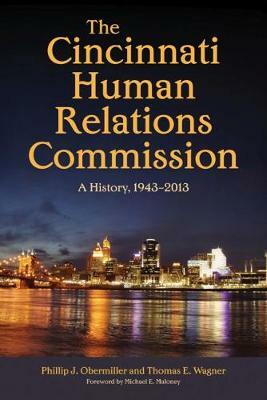 The Cincinnati Human Relations Commission: A History, 1943-2013, is a decade-by-decade chronicle of the agency: its accomplishments, challenges, and failures. The purpose of municipal human relations agencies like the CHRC was to give minority groups access to local government through internal advocacy, education, mediation, and persuasion-in clear contrast to the tactics of lawsuits, sit-ins, boycotts, and marches adopted by many external, nongovernmental organizations. In compiling this history, Phillip J. Obermiller and Thomas E. Wagner have drawn on an extensive base of archival records, reports, speeches, and media sources. In addition, archival and contemporary interviews provide first-person insight into the events and personalities that shaped the agency and the history of civil rights in this midwestern city.